Get professional Opinion and Treatment about your Knee Meniscal Injury. Minimal Invasive to treat your Meniscus Injury by Experienced Knee Sports Surgeon. Call us +65 97731458 to schedule for an appointment. What is knee pain due to Meniscus Injury? The meniscus is a small “c” shaped cartilage that acts as a cushion in the knee joint. They sit between the femur and the tibia bone, one on the outside and one on the inside of the knee. A meniscus tear occurs when the cartilage tear and are injured usually during movements that forcefully rotate the knee while weight bearing. A meniscus tear occurs when these pieces of cartilage tear and are injured usually during movements that forcefully rotate the knee while bearing weight. A partial or total tear of a meniscus sometimes occurs if an athlete quickly twists or rotates the upper leg while the foot is firmly planted. This often occurs in field sports such as soccer and football. How is Meniscus Tear diagnosed? A meniscus tear is diagnosed by taking a complete history and performs a physical exam. Pain, pops, or clicks during this test may suggest a meniscus tear. An MRI may also be done to see the extent of the tear. 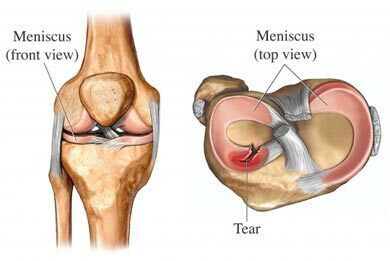 What are the treatments for Meniscus Tear? Treatment varies depending upon the extent and location of the meniscus tear. The treatment options are available from oral medications, injection, physiotherapy, platelet rich plasma therapy and surgical intervention. A large meniscus tear that causes symptoms or mechanical problems with the function of the knee joint may require arthroscopic surgery for repair. In this procedure, a small camera is inserted into the joint through a small incision, while surgical instruments are inserted into the joint through a second, small incision. With the camera, the surgeon can see the entire joint and remove and repair the torn pieces of meniscus. The goal is to save as much of the original, normal meniscus cartilage as possible. During meniscus repair surgery the torn section of meniscus is either removed (a partial meniscectomy) or the torn edges are joined back together with suture or tacks. Can Meniscus Tear heal on its own? Ans: it all depends on where the tear is located and how large. If the tear is on the outer rim or edge of the meniscus there is a blood supply and it can heal. If it is in the middle or inner edge the chances of it healing are much less. As for the surgery the latest studies indicate that you should not have the procedure done unless the knee is locking. The reason for this is in the anatomy. The meniscus sits on top of cartilage. The meniscus deepens the joint and helps control the movement of the femur on the tibia. If you take away this piece of meniscus you expose the underlying cartilage to stresses that it would not normally have. This will cause the cartilage to deteriorate which in turn causes a condition of bone on bone. This will lead to the early or premature need for a total knee replacement. What you should be doing is strengthening the entire leg from the hip to the foot. The stronger the muscles are the less likely you are to have problems. So work on this aspect. If you are having locking of the knee or the inability to fully use the range of motion then you should be looking at a surgical answer to this problem. In either case the stronger that you make the leg the easier the recovery.